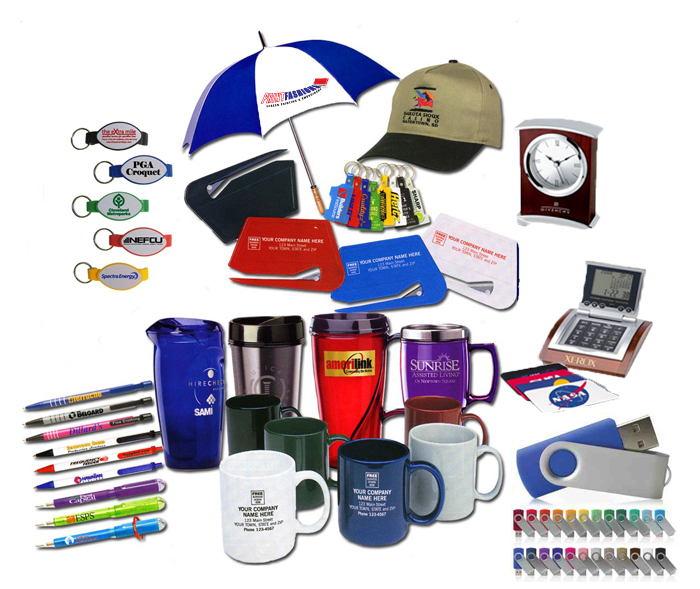 Promotional merchandise, promotional items, promotional gifts, or advertising gifts, sometimes nicknamed swag or schwag, are articles of merchandise (often branded with a logo) used in marketing and communication programs. They are given away to promote a company, corporate image, brand, or event. These items are usually imprinted with a company's name, logo or slogan, and given away at trade shows, conferences, and as part of guerrilla marketing campaigns. Due to rocky economic conditions, many businesses have been forced to dramatically reduce their marketing budgets. Instead, many are turning to customized promotional products to maintain marketing efforts without breaking their budget. These types of products may include corporate gifts, merchandise, custom t-shirt printing or any other product that can have a logo printed on it. What makes promotional products so effective? People love free things. It really doesn’t matter if you’re giving out pens, water bottles or notepads; people will appreciated whatever it is that you give them. These items keep your business name on the person’s mind and your act of giving them a free item immediately leaves a good impression on the person. As far as marketing strategies go, promotional products are long term. They can still bring in new clients or customers years after they have been distributed. This is a major reason why so many large corporations still hand out promotional products regardless of how prominent their name is in the industry. At the end of the day, it is a cost effective marketing strategy, especially when compared to other methods. When these promotional items were used as a sole marketing strategy, consumer impression of the brand was increased by a staggering 84 percent and consumer interest in the brand was increased by 69 percent. In addition to this, consumers enjoy receiving promotional items and are more likely to believe that the company cares about them. There are a plethora of promotional items on the market today. Examples include: t-shirts, key-chains, mugs, pens, hats, water bottles, notepads and other inexpensive token items. Here’s a great article on why t-shirts make such effective promo products. 1. What is the goal (or goals) of your campaign. Brand recognition? Acquiring new customers? Improve existing customer relationships? 2. Plan ahead. It will take a few weeks to have customized promotional products created, so make sure you get your ducks in a row well before you want to start getting you items out to the public. Failing to plan is planning to fail! 3. Get creative when it comes to the distribution of your products, as this will make it memorable for the recipients and increase the impact of the campaign. 4. Choose products that lots of people will see. You don’t want your promotional items to be hidden away—you want them to be displayed, passed around and shared. Paperweights and refrigerator magnets are two examples of items that remain in site and get seen by others.